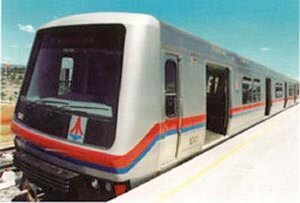 Construction of the metro started in 1992 and the system was due to open in 1999. Eventually the official inauguration took place on 31 March 2001, although regular service did not start until Sept. 2001. 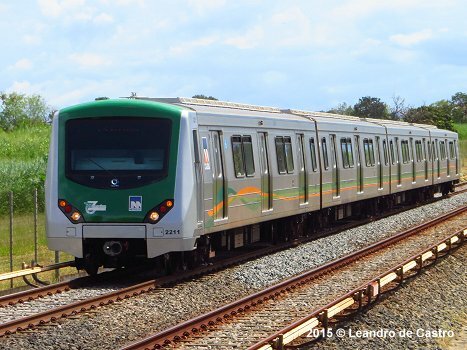 During the first months the metro operated only from 10:00 - 16:00 along 32 km of the 41 km network (from Rodoviária to Taguatinga and Samambaia) with only 11 stations open for passengers. 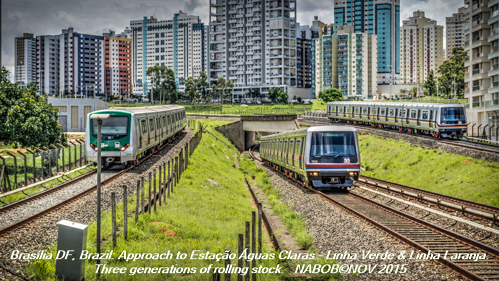 Both lines, the Green Line (linha verde) and the Orange Line (linha laranja) start at Central (Rodoviária bus terminal) and share tracks through Asa Sul ("southern wing" of the city centre) and Guará. 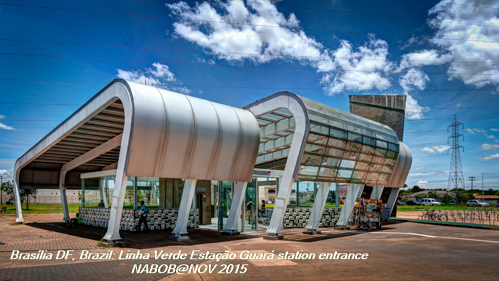 Both lines separate at Águas Claras, the Orange Line runs south to Samambaia and the Green Line heads west to Taguatinga and later to Ceilândia. 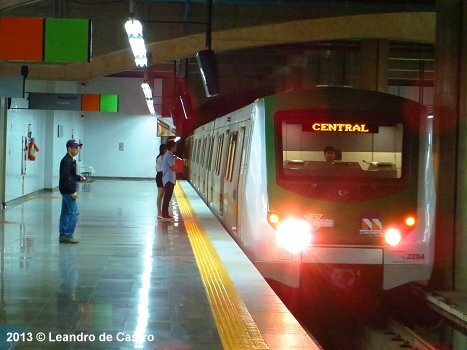 The metro runs underground from Central to Terminal Asa Sul, then on the surface towards the west. Stations are equipped with escalators and elevators. 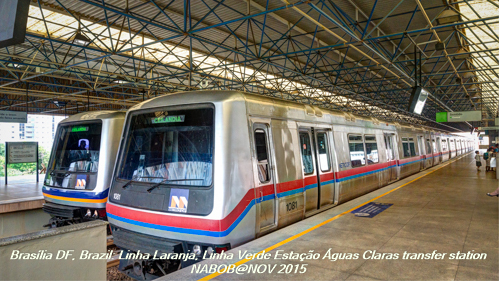 Metro service is provided by 20 4-car trains with a capacity to carry 1350 passengers. From space, the central area of Brasília is formed like an aeroplane, with the boomerang-shaped wings being pierced in the middle by the body, a wide central avenue that plays host to many of Niemeyer's architectural masterpieces. The Metro starts at Central Station, located at the crossing of this north-south (wings) and east-west (body) urban structure and heads west as a single line before splitting at Águas Claras and heading further west to newly developed areas within the Federal District but outside of Brasília proper. As such, the 42.4km and 24 stations only serve half of the immediate city, the northern and eastern parts of the capital being metro-less. 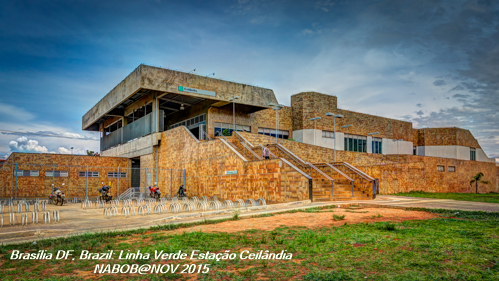 Central Station is located at the north side of the large Rodoviária/bus station from where a long walkway with interesting shafts of natural light brings you to the station. This is the predominant focus of trip generation for the Metro. With few other trip generating stations, there is a very unequal passenger distribution on the system with trains packed in one direction and travelling virtually empty on the reverse run, depending on which peak hour it is. Central Station itself is quite a large station with counters issuing card-based tickets (R$4.00) and bi-directional gates which change access direction depending on inbound or outbound passenger dominance. The lower floor houses the platforms and these are located at right angles to the entrance walkway. Services run from 0600-2330 and the initial journey is underground through a very wide twin-track tunnel which offers long views into the distance. Heading west, the initial stations have many similarities, with a heavy, dark, concrete environment giving way at the platform level to pale-toned tiling as wall covering, smart station signage, and curved recesses. Platforms are designed to take 4-car sets and are quite short as a result but have good depth to manage peak demand. Station signage is clear and large and stylish - with a grey background and coloured squares (green/orange) corresponding to lines served. There are also information boards with geographic and schematic route map, and vicinity map. However, there are no station announcements, no RTI or any timetable information at all. Above ground, the entrance buildings are along each side of the broad avenue and consist of elaborately created concrete, glass and tiled structures that are in keeping with the modernist style of the city's architecture. A number of planned stations remain unopened on this stretch - the carcass of the platform area can be clearly seen, and the stations are named on geographic and train strip maps, though they are in unbolded type. There is no work going on either below or above ground and so this situation is likely to continue for some time. This means that there are often lengthy gaps between stations, and with an average station gap of 1.8km, the trains do go at quite a speed. 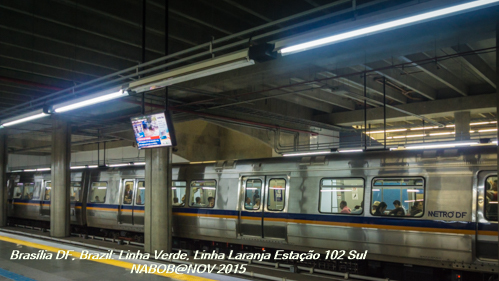 Moving above ground after leaving 114 Sul (the last station in the "planned" area of Brasilia) the character of the system changes. Stations are large and basic, with overhanging corrugated roofing, a mix of side and island platforms, and open views to the distant commuter towns, scrubland and building sites. Guará is probably the nicest station on the system as it is located in a deep cut and is roofed (albeit at ground level). There are stylish wall designs and the station is bright and airy when compared to the underground stations and the basic structures of many of the above-ground stations. 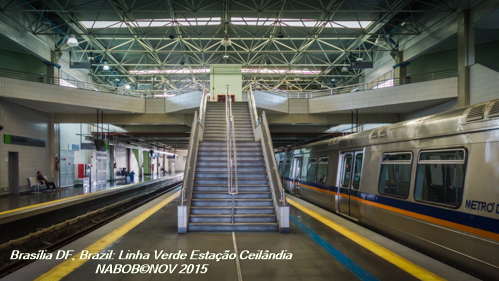 Further west, Águas Claras is the largest station on the network with two island platforms, the outer tracks serving the orange/Samambaia branch to the southwest, and the two middle lines running west on the green/Ceilândia line. With elevation, grade and cut running on this part of the line, there are some great views although none can beat Águas Claras. Looking east on the elevation there are dense housing complexes, whilst to the west is the flying junction and steep rise as the lines split. 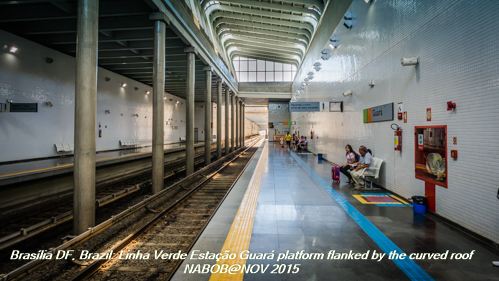 Both branches have interesting sections - the green line (Ceilândia) has short tunnel sections, an underground station at Praça do Relógio and some good elevated views around Centro Metropolitano. 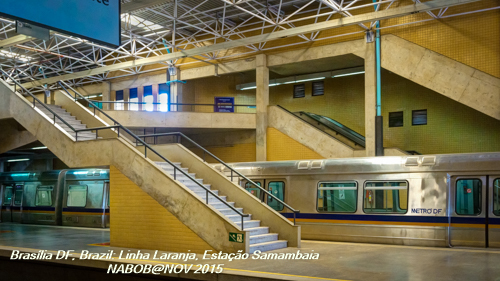 The orange line (Samambaia) has more station uniformity but the large sheds are located on this section; there are some steep climbs and descents along the route and there is some good elevation around Furnas. The duplicated part of the system has 6min base headways, with each branch operating 12min frequencies - schedules dovetailing to ensure a uniform gap on the dual line section between Águas Claras and Central. 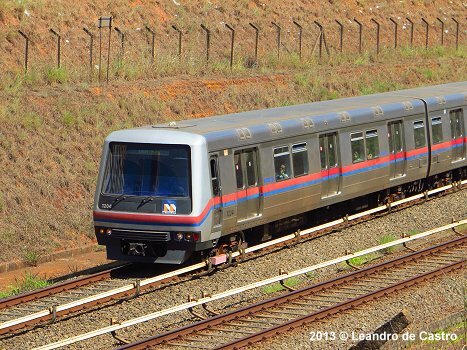 There are two types of Alstom stock in service, with trains made up of four individual cars. The older metallic stock [originally built by Mafersa] has a large front window and thin blue/orange or green/orange stripe along the side. The newer stock of 2010 has a slightly more angled frontage with a dominant green panel. The stock has paired and single seating in hard plastic seating in red/blue (old stock) and green/blue (new stock) - a seating structure that provides ample room for standing passengers. The doors are quite wide and are topped by a smart strip map and there are also audio/electronic announcements. In summary, Metro DF is an unsophisticated system. A flat fare structure, a simple timetable structure and route network of alternate trains travelling on each branch, basic station design and pretty plain stock. Unadorned by niceties, it gets the job done in an effective way.